Two years ago, Wake Forest University freshmen arrived on campus as the first class to receive laptop computers as part of a new campaign to enrich undergraduate learning through new technology, classes, faculty, scholarships and more. This fall, those students — juniors now — are turning in their IBM ThinkPads for new ones as the school marks another stage in carrying out the Wake Forest Undergraduate Plan. The new computers — ThinkPad model 380XD — will be distributed to juniors on Saturday, Aug. 22, from noon to 4 p.m., and on Monday, Aug. 24, from 1 to 6 p.m. 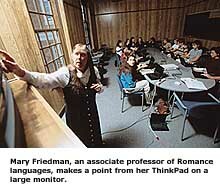 Approximately 940 juniors will bring their old computers — ThinkPad model 365XD — to Reynolds Gymnasium to make the switch. The used computers are being sold to the Winston-Salem/Forsyth County schools in September. Members of this fall’s freshman class will pick up their ThinkPads in Reynolds Gymnasium from 8 a.m. to noon on Aug. 24. Nearly 600 of about 950 freshmen arranged to receive their computers early this month at their homes. Students are also provided Lexmark color inkjet printers that they use through their four years of college. All of the printers are distributed at the gymnasium. As part of orientation, freshmen will attend a two-hour introduction to the computers. The sessions are offered in Calloway and Carswell halls on Aug. 24 from 12:30 to 5 p.m. and on Aug. 25 from 8 a.m. to 5:30 p.m. The Undergraduate Plan, as a whole, is progressing well, said Paul D. Escott, dean of Wake Forest’s College of Arts and Sciences. “More than two dozen new faculty have been hired, and more are coming in the next few years,” Escott said. The Undergraduate Plan calls for hiring 40, in all, by 2002. “The faculty deserves recognition for creating more than 100 first-year seminars,” he added. The new classes, with only 15 students in each, develop analytical, writing and verbal skills early in students’ college careers. Students already are taking advantage of additional scholarships for studying abroad-including in Wake Forest’s residential study centers in London and Venice. In keeping with the plan’s call for fostering international study, another study center will open next fall in Vienna in a villa recently bought by Wake Forest. International issues will receive close examination throughout 1998-99 as the university observes the Year of Globalization and Diversity. Since the plan’s launch, the university has devoted each year to a series of events built around a particular theme. During the plan’s first year, the university celebrated the Year of the Arts. That was followed by the Year of Religion in American Life. New merit fellowships are being awarded, as well, this year to juniors for work on research and other projects with senior faculty. The new technology plays a part in that effort, with faculty reporting they are finding expanded opportunities for communicating and working with their students. 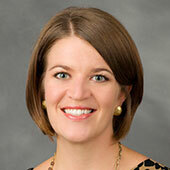 “Many members of the faculty are developing new and enriching aspects of teaching through the Internet,” Escott added. Students and faculty have access to the Wake Forest computer network practically everywhere. Classrooms and residence hall rooms have computer connections. In many classrooms, a connection to the network is available for each student. “The technology has helped me to organize multimedia materials for the classroom. It has provided me with a complex platform for presenting many concepts and ideas,” said Dixon, who grew comfortable with the technology only last year. One of the course’s major assignments is to prepare a computerized presentation on a topic using Power Point software. Dixon anticipates having protest singers join in this fall on some class discussions that take will take place on computer, outside her classroom. The ability to bring outside experts into computerized class discussions is one of the many positive features of the technology, according to Wake Forest faculty who are using it. “It looks like we’ll have people from South America, Eastern and Western Europe, Pakistan and the U.S. participating electronically,” said Craig Runde, director of the International Center for Computer Enhanced Learning at Wake Forest. He has teamed with Professor of Politics Charles H. Kennedy to teach the class, which examines the stresses on today’s nations caused by various aspects of globalization. “The technology helps bring other voices from distant parts into our classroom,” Runde said.